Chopper Sword | BUDK.com - Knives & Swords At The Lowest Prices! This unique sword will delight motorcycle fans and true bikers! 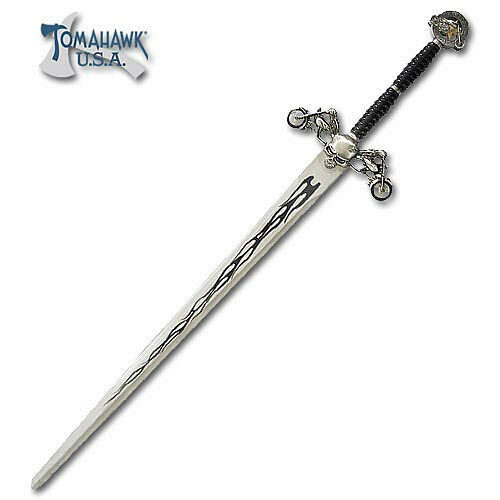 This sword measures a massive 52" overall in length and offers a stainless steel 36 3/4" blade with a laser etched flame design and satin finish. The cast metal handle features a huge pommel with a motorcycle inset, spiraled two-handed grip, and a dual motorcycle guard centered on a demonic skull. This awesome sword includes a custom wall plaque so that this outstanding collectible can be prominently displayed anywhere! Just received this sword yesterday and WOW! I'm in awe of it. It's much nicer than the item's picture portrays it. The wheels on the guard are rubber coated and they rotate. At the end of the hand guard there are clear crystals as the motorcycles headlights. It definitely dominates my living room and looks just great. Using metal polish on the blade doesn't remove any of the flame that runs down the blade and the blade comes sharpened. All my Bro's will be jealous now, lol. Thanks BudK.